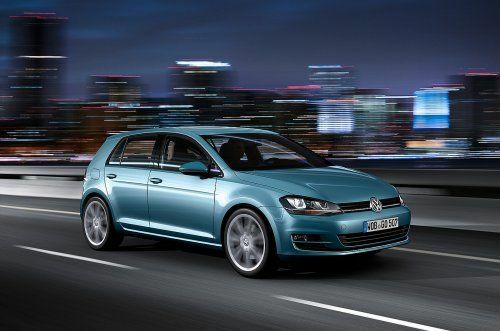 The 2013 Golf was given the title of World Car of the Year at the New York International Auto Show, marking the second consecutive year that VW has won the accolade with the company winning four times in the past five years. Volkswagen is definitely on track with four World Car of the Year wins in the past five years. This year, the all-new 2013 Volkswagen Golf was chosen, the second time the Golf has won the award with the last time being the car's 2009, sixth-generation rendition. A total list of forty-two vehicles from around the world were considered for the award initially. Vehicles in consideration must be available on at least two continents during the period of January 1 of the previous year and May 30 of the current year (Jan 1, 2012 to May 30, 2013 in this year's case). Vehicles are voted upon by an international jury panel of sixty-six top-level automotive journalists from twenty-three countries globally. Juries are appointed by and overseen by the World Car Steering Committee which is itself made up of automotive journalists taken from the jury pool. The initial list of 42 vehicles was narrowed to ten finalists and finally to four finalists. The four this year were the 2013 Mercedes-Benz A-Class, the 2013 Porsche Boxster Cayman, the combined entry of the 2013 Scion FR-S / Subaru BRZ / Toyota 86 / GT 86 (commonly called the "Toyobaru"), and the winning 2013 VW Golf. In the past five years, four of the World Car of the Year awards have gone to Volkswagen. Past winners were the 2012 Volkswagen Up!, the 2011 Nissan LEAF, the 2010 Volkswagen Polo, the 2009 VW Golf, and the 2008 Mazda2 / Mazda Demio. Other winners have included vehicles from Lexus, BMW, and Audi. This year was the ninth year that the World Car awards have been given. They have become a big part of the New York International Auto Show as a complement to the regional and national Car of the Year awards given.